That question has one simple answer: it is the internet of cryptocurrencies, digital currencies, mobile money and money transfer. Tomorrow, you may have to add other aspects of money ‘monetization’, as we celebrate the arrival of #Bitcoin onto the asset trading listing on the Chicago futures exchange, in the USA. …Especially as the US Fed chief Yellen hailed it as a highly ‘speculative asset’! → In the Bitcoin Eco-system, any such announcements from the ‘Old world’, usually compel the crypto community into mining even deeper!…whilst the ‘Millenial money’ keeps on going up in value! → They play Foosball, whilst the rest of the planet, still play soccer rules!! The list of planned #ICO, next year will only highlight the digital tsunami coming in many shapes, tokens and currencies! Just check this awesome list here, if you do not believe us! Although the top crypto-currencies dubbed as the #Jackson5 by the crypto-community will still run the show for a while. They are are: Bitcoin, Ripple, Ethereum, Litecoin, and Dashcoin. So much so, that we have decided to create a Facebook page: Team Crypto Geeks, and, and…and….a Facebook Crypto group dedicated to mobile money, crypto-currencies and bitcoin: #ADMP Crypto TeaM. A safe place where you will be able to find out how it works, how to get trained, where to buy and find them. Our analysts and specialists will be on-hand to give you advices and to provide you with real insight into the ‘internet-of-money’, the ‘Millennial coin’ that is #Bitcoin, via a chatbot. We are also planning on releasing an app, ADMP Crypto Geeks, a name choosen by our very discerning community of tastemakers: the ADMPers! We have another visit this week, from a bright GUEST-BLOGGER, and that is Mark, a foosball Blogger and pro. 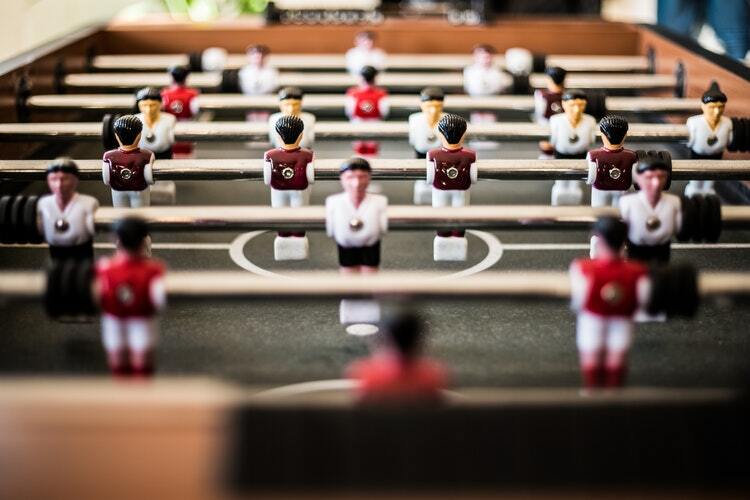 We all know how strategic it is to have within your co-working space or startup headquarters, Foosball tables, ping-pong tables, like tech giant Google does, for example. Electronic Counter Punch (ECP) by #Hermann Djoumessi, MA – ADMP Senior Crypto-Consultant & Editor. What does the ideal workplace look like? The workplace is a combination of office and atmosphere in the office. It is not completely related to the design of the office because you can’t achieve the ideal workplace if the atmosphere in it is not right. Due to that, I want to share with you, 3 design tips you can do to achieve that ideal workplace for you and your team. Modern offices aren’t about cubicles, they are all about open space and placing tables one next to the other. That design offers your team the chance to ask for an opinion, an advice or an idea. That is the best way for people in the team to bond one with another. In the open office design, people are often brainstorming which is one of the most effective ways to solve a problem or to come up with an idea. If you are surrounded by people who think like you do and they believe in what they are doing, you won’t have to do much to maintain work atmosphere. Observe your team and react when you notice the tension in the air. People don’t like to work in the office where everybody is fighting or hating each other. That is not good for the business because that is not how the team acts. NO matter how much your team loves their work, they have to have a break during the day. There is a chance that their concentration will fall and they will make mistakes. So, to avoid that, give them lunch break, but a proper one. Do not allow them to eat on the work desk because they have to move away from the work during the break. The best way to do that is to design a great break room where they can sit, eat, relax or even play a foosball table. Yes, a foosball table is a great addition to the break room because it gives your team a chance to release negative energy. The match lasts only 5 minutes and I am absolutely sure they can’t say no to foosball. I mean, nobody can. If they play one match every day they will have a great time and, after the break, they will continue with their work relaxed. Mark is a blogger who has a blog about foosball. His blog is called Foosball zone and it is dedicated to people who love foosball. His main focus are articles for rookies in foosball world which you can see from the posts he writes. Those are mostly foosball table reviews and reviews of foosball table parts like top quality balls for foosball.